Dealer in auto salon helping cheerful couple with kids with car exploration before purchasing. Movement stabilized 4k shot. 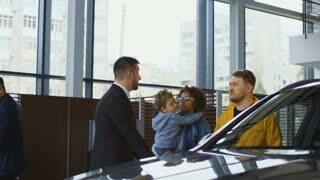 Consultant helping woman and kids to get inside of new car while testing it in dealer shop. Movement stabilized 4k shot. Cheerful successful woman and man having keys of new car from dealer and embracing with kids in excitement. Movement stabilized 4k shot. Successful man and woman sitting inside of car with kid and talking to dealer while making decision of purchase. Movement stabilized 4k shot. Successful man and woman sitting inside of car with kid and talking to dealer while making decision of purchase and gives a credit card to the seller. Movement stabilized 4k shot. Dealer in auto salon helping cheerful couple with kids with car exploration before purchasing.